If all the products you have added to your Cart66 management console are unavailable then your WordPress site is not connecting to your Cart66 account. 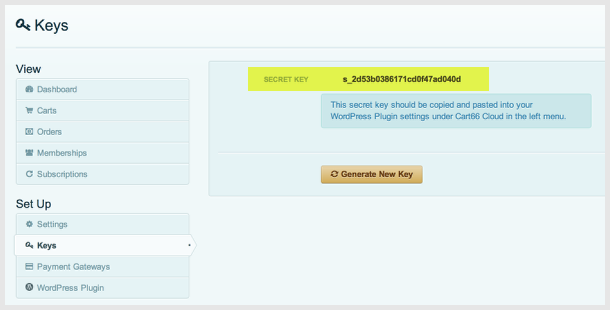 The most common reason for this is that the Cart66 secret key has not been entered into the Cart66 settings of your WordPress plugin or the secret key is incorrect in your WordPress plugin. To find your Cart66 secret key, log in to your Cart66 account at https://manage.cart66.com and navigate to Setup => Keys. If you are able to see some of your products but one of your product shortcodes is not working, check to make sure the SKU in your shortcode is correct. If the SKU "tshirt" is not spelled correctly or does not exist in your Cart66 management console then the product order form will not show up on your website. Another reason why your products might be unavailable is that the IP address assigned to your website by your web hosting company may have been flagged for malicious activity. This is not your fault. Web hosting companies often share the same IP address among a large number of websites. If one of the sites sharing your IP address hosts malicious software, viruses, sends large amounts of spam, etc. it will tarnish the "reputation" of your IP address causing it to be flagged and blocked by the Cart66 security system. You can check to see if your site is listed in an IP reputation monitoring service such as Alien Vault by going to a web address like this: http://www.alienvault.com/apps/rep_monitor/ip/184.172.130.210 and replacing the IP address at the end with your IP address. If your IP address shows up then it is probably the case that your site is being blocked by the Cart66 security system. There are two things you can do to work around this problem.